This private two-story home - bright, clean, and inviting in an island style - sleeps eight and seats even more for meals. Walk through the front door, and step onto the open lower level of your vacation home. Like a gentle ocean wave, your calm gaze moves through the kitchen, into the living room, and right outside onto the lanai. Your cell phone and laptop link swiftly to the home's solid wifi connection. You begin to breathe more deeply. Everything is in its place, and your relaxation time has begun. Up the single flight of stairs, you'll discover three gorgeous bedrooms and two full baths with showers. Each offers comfortable furnishings, quiet lighting, tasteful beach-chic decor and - most importantly on Maui - ceiling fans and air conditioning! The master bedroom, open to the tradewinds, showcases a California King size bed. This room comes complete with full length mirrors, closet space, and a large dresser, as well as an en suite bathroom with a glass-walled shower, and a single vanity with a large countertop. Bedroom two, bright and airy, offers a beautiful queen size bed, mirrored closets, and a pair of dressers with plenty of space. Bedroom three is perfect for either the kids or Ozzie and Harriet. (You guessed it! This room has two twin beds.) If you prefer, these beds can be brought together to create one full size sleeping area. This room also has a dresser and mirrored closet. The shared hallway bathroom treats you to a refreshing spa-like shower, where there is space enough for two adults, and the tiling is reminiscent of river rock. Separate light switches can be used to highlight either the shower, or the single basin sink and counter space. A stacked washer and dryer sit just across the hall, ensconced within a closet. This peaceful and quiet Hawaiian hale is tucked into the back of the Puamana Community. The closeness of the surrounding acreage ensures your proximity to the grounds' amenities: three pools, a play structure, a clubhouse, and a tennis court. Great snorkeling and swimming spots are right offshore, and plenty of fluffy beach towels are waiting for you in the hallway closet. One of the more special and hidden aspects of this Puamana home is its pair of caretakers. Kevin and Kelly will make sure you're settled in when you arrive, and they'll see to it that you have everything you need throughout your island stay. The home comes equipped with all the basic (and beach!) supplies the two locals could think of, but you and your family may need something more specific. It is reassuring to know that Kelly and Kevin - kind, knowledgeable, and responsive - are just a quick text away. You can park one car in your driveway, and one nearby in any uncovered parking space. rent bicycles nearby to ride into town any time you wish. Lahaina is just a few miles away. This attractive hot spot offers delicious food, live entertainment, incredible shopping, and a movie theater. All types of boat tours leave from the harbor, too! When you return home to relax, this place is perfect. The kids can race right up the stairs to wash off the salt water and beach sand, and everyone can settle on the couch, at the large dining room table, and in the chairs on the lanai. There is plenty of space on the floors for little ones to play. Older kids will love running around on the lawn while the rest of you cook, chat, and sip some made-on-Maui pineapple wine. When you are ready to cook, the fully-equipped kitchen and the outdoor gas grill are all set for you! This kitchen was just beautifully renovated. You'll find brand new, stainless steel appliances alongside the large marble counter top that divides the cooking area from the living room. Inside the honey-colored cupboards, you'll find everything from stemware to plastic cups and gravy boats to cereal bowls. In addition to fun family meals, you can easily host a party or an extra-special holiday here. Spatulas, whisks, mixers, and even a turkey pan await your signature dishes! And to give you even more relaxation time, a dishwasher - a convenience not always present in Hawaiian hales - sits at the ready. The living room couch is just perfect for Hawaiian cat naps on lazy island afternoons. If you feel like taking in a movie at home, or checking up on the rest of the world, you'll have 24 hour access to a giant flat screen television with DVR, and a 3D Blu-ray player with a stereo! To hearken back to simpler times, sit at the writing desk to compose stories of your travels in letters, to send friends and family back home. No matter what you choose to do, the room's ceiling fans, air conditioning, and lovely recessed lighting (yes, it can be dimmed!) will ensure that you are cool and comfortable. The lanai outside - just a single step from the living room's back door - is almost completely screened in with tropical foliage like birds of paradise and ferns. Fishing floats made of colored glass hang above the outdoor table, casting colored shadows when the sunlight shines through. Once the Maui sun sets, the string of lights overhead can glow for you at night. When it comes to daytime playtime, this lanai is well stocked! All you need to bring is your bathing suit, hat, and reef-safe sunscreen, because here you've got: beach towels, beach chairs, beach umbrella, sand toys, boogie boards and an ice chest. There is even an outdoor shower and a hose to rinse everything off once you're back! And if you want to clean up a bit more, but you don't feel like making that big commitment to shower upstairs, the half bath on the lower level may be just what you're looking for. So, what do you think? Are you ready to make this your next great vacation home? Let us know! We look forward to hosting you at Puamana very soon. Aloha! WHY PUAMANA IS THE PLACE FOR YOU! If you're looking for the right place to stay on Maui, consider Puamana Community Townhomes. The beauty of leaving your neighborhood, flying to this island, and staying in Puamana is that you end up somewhere new that also feels like home. The folks who live in this spacious, secure, 30-acre complex are a peaceful mix of residents and visitors. Those you meet are likely to smile and nod, even if they've never seen you before, and then once they've seen you, you'll feel like family! Puamana's larger pools, the Dolphin Pool and the Mountain Pool, are a bit inland. Everyone is welcome to splash and play here! The Dolphin Pool is accessible to all abilities, too; once you give prior notice to the manager, a portable poolside lift can bring you into the water with ease. Children can shout, run, and climb off some energy on the small play structure right next to these two pools. One of you can watch the little ones play, and another can lie back and float, running supervisory interference inside the chain-link fence. Maybe . . . flip a coin? While spending time at Puamana, you can host a dinner party in the oceanfront gazebo, hit some balls on the tennis court, throw a frisbee on the expansive lawns, and work out in the exercise room (or at least consider it; this is a vacation, after all!). If you'd prefer ocean spray on your face and sand between your toes, Puamana's shoreline invites exploration. Pick your way among coral rubble, stones, and driftwood, and watch for the whales in winter while gazing at the boats moored offshore. Whatever you choose to do, remember - you're on island time! Tina and I honeymooned here in 1985 and fell in love with Maui. We visit every year and always dreamed of owning a home in Lahaina, which consistently has the best weather on the island. When we were introduced to Puamana, we knew we had found our slice of paradise. We invite you to come stay at our home, relax and enjoy the abundance of beauty and Aloha you will find here, Mahalo Nui Loa. The ocean, with beach access, is only steps away! Four sets per bathroom. Several beach towels also available. New gym equipment and free weights in Community clubhouse $5/day or $25/week. A cash deposit is required. Large living room with L-shaped sofa that can seat 8. Pulls out to queen sleeper sofa bed. New 55" SMART, Flat screen TVs in living room and Master bedroom (TV was added early 2016). Time Warner basic cable channels. There are some in unit and access to Puamana Community library. Free to use. Honor system. Some beach and sand toys. Great lawn directly off of the lanai! Newly resurfaced tennis court. Come at 4:45pm to the clubhouse to sign up for the following day! Clubhouse closes at 5pm. Ka'anapali is the closes course. They have 2, the Kai and the Blue. Kapalua is the number 1 rated course in Hawaii is nearby as well. They have 2 courses as well, the Bay and the Plantation. Three pools onsite. Ocean Pool: quiet pool to enjoy the sound of the waves Dolphin Pool: great for the whole family Mountain Pool: fun pool for activities, gatherings and relaxing. Our stay was so comfortable! We had a group of six adults. The kitchen was clean and all dishes were provided to fit our needs. We enjoyed the patio and grill. We thought the ‘live’ privacy wall was beautiful. We had a wonderful stay & will definitely be back. The home is comfortable and very well stocked. The layout worked great for our group of 5 adults and 3 kids. We loved the back patio so much and ate almost every meal out there, along with coffee in the morning and drinks in the evening. The grounds are lovely and well maintained. The grass lawn was perfect to lay a blanket in the shade in the afternoon for reading and letting the kids to run around. Kevin was a wonderful host and picked up the phone when we called with a couple questions, which he resolved immediately. All in all a fantastic week! Our family of 6 had a perfect stay in this beautiful home. It was well-stocked & ready for our arrival. The grounds were neat and clean; the pools were nice; and we were close to everything in Lahaina. We would definitely recommend this location to our friends and would love to return here some day soon! Mahalo for everything! We loved it! The proximity to the beach and walking distance to Front Street was great! Puamana is a great location and we highly recommend this property! Kevin was a gracious host and always helpful. The unit was clean and well stocked. It was also lovely decorated and we felt very much at home! With the beach so close we watched the sunrise most mornings and many beautiful sunsets. We would definitely recommend this home! Great Lahaina location in gated Pumanama community. Nicely appointed property. We had a great stay at this unit in the gated community of Pumana. 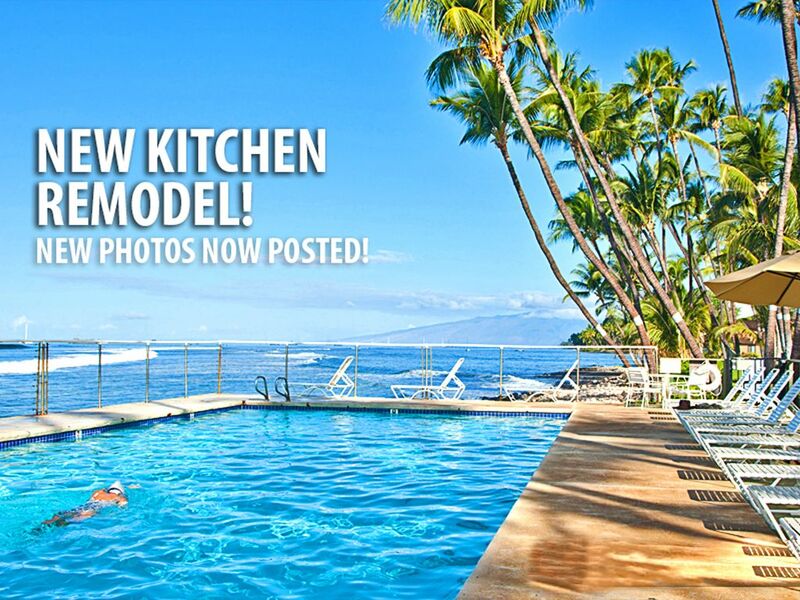 Convenient location - a 15 minute walk to the Lahaina strip. Accommodated two families; 4 adults and 4 late teenagers with 3 bedrooms and pull out couch and high rise blow up mattress on main floor. Worked well as a base camp for our stay. Would enjoy staying here again! Overall, our stay was really wonderful. The short walk to the private beach was the big attraction for us and the kids! There was a big open area behind the townhome where my kids could go out and run around and play. The location of the private community is not far from Lahaina - we even walked to the town one afternoon, no problem. Even though the townhome is close to the main road, it is really quiet, no issues with noise. There were just a few items that we’d like the owners to consider.... the mattresses were very uncomfortable and made for some sleepless nights. Secondly, there is just one set of silverware, so each meal, we used all of the silverware in one sitting, maybe just add a second set at least? Lastly, overall the townhome was clean, nothing gross, or unpleasant, however there was just a lot of dust (lamps, walls) so just a quick wipe down would solve that, no biggie. The kitchen was great to cook in, plenty of appliances (thank you!) and the wine fridge was used with enthusiasm! Great touch! I think you had upgraded the grill since the last pictures you have posted, and that was fantastic! We grilled almost every night and it worked very well! There were plenty of beach toys, thank you, maybe add a beach umbrella to the mix? We were thankful for the air conditioning for sure, and the house was very comfortable to be in when we needed a break from the beach. Overall, we absolutely knew we would love our vacation in Maui, but your home made our vacation feel more like home away from home and we really appreciate it! Aloha! Puamana ASF is the Puamana security, parking and association fee. This is already included in your quote. It covers the first vehicle's parking. A max of two vehicles are allowed. The second vehicle parking fee is $10+tax/day and is paid directly to Puamana (via Clubhouse office window) upon your arrival.